On 28 June, Brian Arendell took over the reins from David Hall as he was sworn in as President of Cranleigh Rotary for 2018-2019. It was also time to reflect on the year's activities. Rotarian Patrick Leake, this year's new Membership Chairman, was pleased to be able to announce that Nationwide Building Society in Cranleigh has agreed to become a Corporate Member of the Club. "This is part of our recruitment programme to work closely with those organizations that share the same ethos with regard to helping the local and international community," said Patrick. By becoming a Corporate Member, four Nationwide personnel will be able to attend meetings, assist with projects, serve as Club officers and on Club committees, and bring invaluable experience to the Club. The Nationwide staff members include cashier Sylvia Webb, who is the lead Rotary member, and several other nominated associates. Joint community activity was demonstrated at the Cranleigh Carnival on 30 June, when the Rotary and Nationwide stalls were in juxtaposition at this very busy event. Since then, Informed Choice, a local, award-winning firm of independent Chartered Financial Planners, has also agreed to become a Corporate Member of Cranleigh Rotary. "I am also pleased to announce that there are other Cranleigh key companies that have shown interest in joining us," said Patrick. 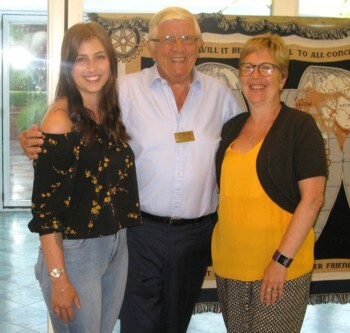 "Cranleigh Rotary extends a welcome to all who wish to help us with our many community events, whether it be as 'a friend of Rotary' or as a full member."